My son James and I got involved with the Silicon Valley Young Makers team back in March 2013 with encouragement from team member Malik and his dad Jean (James and Malik have been buddies practically since birth). It’s so impressive what the team has accomplished in the last few months. I’m sure we’ll be posting more about all the work that lead up to where we are today, but in this post I’ll give my perspective as a mentor on how the Maker Faire Weekend of May 18/19 2013 went. Friday: Packing, Driving, and… oops! On Friday morning we gathered at Jeff’s house to wrap up last-minute things and get packed. There were actually quite a few loose ends to take care of, and as a result we never had a chance to do a full system test. That turned out to be a bit of a problem (more on that later). Of course, all the young makers were at school, so we didn’t have any help. In the late afternoon, we were finally ready to load up and go. Getting Saphira into Jeff’s truck is quite an operation, but we got her in, along with the robotic base and the big particle board castle wall, which just barely fit, resting on top of Saphira. We set the castle wall on top of Saphira, closed the truck tailgate and rear window, and the caravan (Jeff’s truck, Sue’s SUV, and Jean and Gordon’s cars) headed north on I-280 to San Mateo. Arriving at the San Mateo County Event Center, we drove the truck in the gate, found our site, parked, and tried to open the rear window of the truck and… it wouldn’t open! The castle wall had slid backwards and had jammed the left latch for the rear window. Try as we might, the latch would not open. It would have been a real bummer if Saphira stayed locked in the truck all weekend. Fortunately, Jeff managed to wrestle the latch open and Saphira was free. Maker Faire is a very well-oiled machine, and we had lots of help getting our site ready. Electrical power was all ready to go, and a temporary shortage of safety barricades was resolved immediately by staff. While we were setting up, the Makers-only party was ramping up (and was right next door, conveniently). Free Paella for everyone, and Jean, Malik and I were served our dinner by none other than Dale Dougherty! It was also great to get a visit from Team Viper (Saphira’s original Makers) while we were setting up. Their support over the months leading up to Maker Faire was very much appreciated! As it turns out, when I assembled the Powerpoles, I didn’t push the crimp-on part far enough through the plastic body, so the connectors were only engaging the metal clips that are intended to provide pressure on the crimp-ons. I’ve only used the smaller 15 amp versions, and these monster 50 amp versions require a lot of force to seat the crimp-on correctly. As a result, the connection was loose, and one terminal was arcing, which created the heat that melted the plastic. Moral of the story? Read The Fine Manual! Then, when we did our pneumatics test, nothing moved. We attached a monitor and rebooted the Pi, and discovered that it wouldn’t boot, complaining that the root filesystem was corrupt and couldn’t be mounted. Less than 15 hours to go, and we were dead in the water! We decided to take a two-pronged approach to rescuing Saphira. Plan A was to reinstall the Raspbian OS on the SD card, the reinstall the motion control software team member Jasper had written. Plan B was to revert to using the Arduino-based motion controller originally built in 2010. However, since all our solenoids were now hardwired to our new driver circuitry, we needed some way to drive that from the Arduino. I grabbed all of the wire connectors, IDC headers, and DB-25 connectors I could find and stuffed them into my backpack so we could try to wire the things together, but I was hopeful we wouldn’t need to do that. I also rebuilt all of the 50 amp Powerpole connectors (properly, finally). I got to sleep at 1am, worried about having to get everything working on-site. Saturday morning at 7:30 I headed over to Jeff’s house to drop off the rebuilt power connectors, and found our young maker Jasper hard at work reloading Raspbian and installing WiringPi (which we need to drive the GPIO pins). We still didn’t understand why the Pi had failed so badly, and I was worried that we’d have more problems during the day. I headed home to get myself and James ready for the day. Apart from being proud of our young makers for pulling off Saphira in the first place, we were really impressed with how they worked with our crowds, especially the young kids, and explained how Saphira worked during a “behind the scenes” session after each show. They explained how the body motion worked, how the sound worked, and, of course, how Saphira breathes fire. Here’s Malik explaining the pneumatics. She had such a great time, she went and got a Saphira tattoo somewhere! 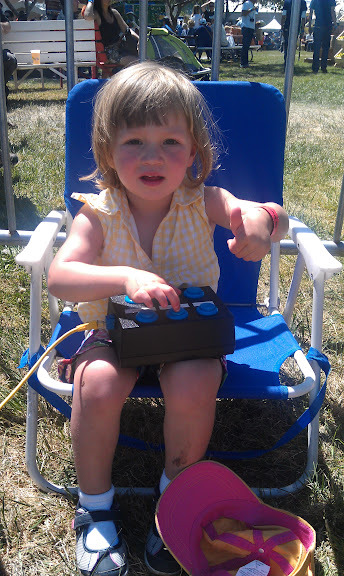 And this wasn’t our only very young maker to operate Saphira’s voice during our shows. This little girl Poppy did a great job making Saphira roar and speak, and look at that big thumbs-up! This is the third Maker Faire I’ve been to, but my first as a maker, and in the three years I’ve been there, I really can’t recall ever hearing any serious complaints. Oh, sure, there may have been some occasional grumbling about long lines, but overall, the atmosphere was just incredibly positive. I think that’s no accident – makers tend to dwell on what’s wrong with something only as long as necessary to make it right. I am looking forward to mentoring our team over the next year. Saphira will be even more awesome in 2014. Other than some hiccups Friday night, Saphira performed flawlessly the whole weekend, due to the excellent work of our young makers team. If you came and saw Saphira – thank you!! This past weekend we made a lot of progress. Saphira is now repainted blue, and new eye prototypes have been casted out of two-part resin. And be sure to have adequate protection when painting! There is some additional footprint on the front to balance Saphira when she rises quickly (she had a tendency to tip forward). We made good progress on building the wood and steel platforms on which we’ll attach the rebuild hydraulics and all of the electronics for the robotic drive and the sound system. …and then helping Jean while he tracks down some minor problems with the wiring harness that connects the Raspberry Pi to the solenoid driver circuitry. The firefighters brought MTV Engine 2 out, and gave all the kids (and the adults) in impromptu tour and demo of the fire engine. Many thanks to the St. Francis Robotics Team and the Mountain View Fire Department! More base build photos later!